Rivers Edge Golf Club is across the Carolina border in Shallotte, N.C., but it is well worth the 30-minute drive north of Myrtle Beach. Designed by legendary golfer/architect Arnold Palmer, Rivers Edge is a true treasure of the North Carolina coast and a crown jewel in the state’s rich golf community. 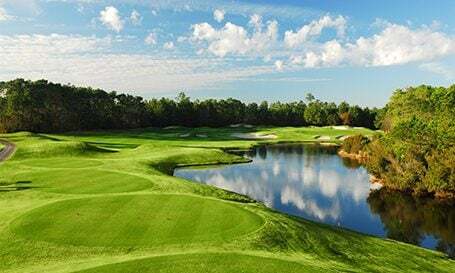 Built on a pristine piece of property on the banks and bluffs of the Shallotte River, golfers who enjoy a tough challenge in a scenic setting give rave reviews of their rounds at Rivers Edge. So do various golf publications, such as Golf Digest, which listed Rivers Edge as one of “America’s 100 Greatest Public Courses” in 2005 and 2007. 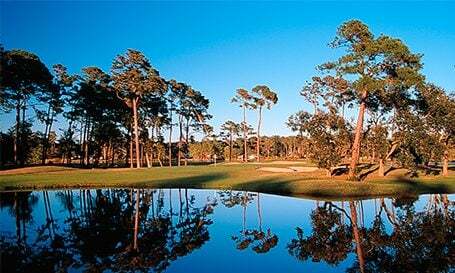 GolfWeek also ranked it the No. 5 course in the Tar Heel State. With six of the 18 holes sitting high on bluffs overlooking the river, this course utilizes natural changes in elevation and the diverse terrain to create a one-of-a-kind golf experience. A tough course but enjoyable to play . The 9th hole beats me everytime i play it. The price is great. The kitchen is challenged when the course is busy. greens were okay but tee boxes and rough were absolute crap. Played before but this round was during the World Am; Over 5 inches of rain fell that week but this course took it well...target golf and hazards await. Green are long and slender which narrows your approach to many. Par 5 17 pin placement that day was not even an option as the two trees took gambling out of your hands...great course and great value even in Summer! One of the most scenic golf courses I've played in the NC/Myrtle Beach area. Tough layout with lots of bunkers in the fairway and around greens. The scenic holes along the Shallott river will eat your lunch if you're not an accurate striker of the ball. Lots of creeks and marshes come into play. Be prepared to shoot over your handicap. Great price for the course! High handicappers beware.